You are currently browsing the tag archive for the ‘Mr_Subjunctive’ tag. The Aeschynanthus cuttings I got from mr_subjunctive at Plants Are the Strangest People put out a bloom, which was surprising because, well, I thought they were concentrating on producing roots not a flower. Anyway, that was a pretty cool surprise. I guess that means it’s safe to name her. Suggestions? My Schlumbergera truncata is budding up. Her name is Easter the Christmas Cactus, which is confusing, but that’s ok, it makes me giggle. I actually have two Schlums, they sit side-by-side, but only one of them is gearing up to flower. At some point, I’m going to do a post about the tale of these two Schlums – because one is decidedly more red and budding, but they both get the same amount of light and water. I’ve been doing some research on the redness (mostly on mr_s’s site, Plants Are the Strangest People) and there are reasons why one would be red and the other a lush green, one budding the other not. BUT. I just started the research and there’s still so much more to understand before I can formulate an answer on why these two sisters are so different. No matter what, though, I’m still going to love them the same. [Thursday] 100 Posts – Woohoo! That’s right my little garlic cloves out there in the blogworld – I can no longer officially whine about being a newbie! This is the 100th post on Good to Grow. Yay! My name is Liza and this is my blog. Good to Grow is my blog and my life – I have a small business in Albuquerque called Good to Grow, taking care of plants around town. See how happy I look? That photo was taken long before the 100th post, but it reflects my current mood. It’s been so much fun meeting other garden and plant lover bloggers, through Blotanical.com (the server is down temporarily, but that’s the correct address) and beyond. Not to mention all the artists, crafts enthusiasts, scientists and environmentalists I’ve met along the way. Thank you all for your support. I have a tremendous amount of respect for the amount of work maintaining a blog involves and all the energy you all obviously pour into your sites. And I have learned soooooo much, about blogging, gardening, and life in general. Please keep up the excellent work – I enjoy it very much. I want to celebrate! I want to give away something cool as a thank you to you all! So far, every vote has been “real.” Either you are all right, or you are all wrong, or it was a trick question. Hahahahaha – I’m totally not above tricking you little pumpkin seeds out there! Tune in Friday to find out the real answer. You can vote until 5pm MST Thursday (that’s 3pm EST). I’ll have another plant puzzler for you tomorrow after the experts. I was going to do a “Name that Plant Problem,” but the “Real or Fake” puzzler seems popular. I have one for tomorrow that might just stump you all. It’s really, really difficult to solve – I can’t wait to hear your guesses! Ok, so are you ready for a giveaway? 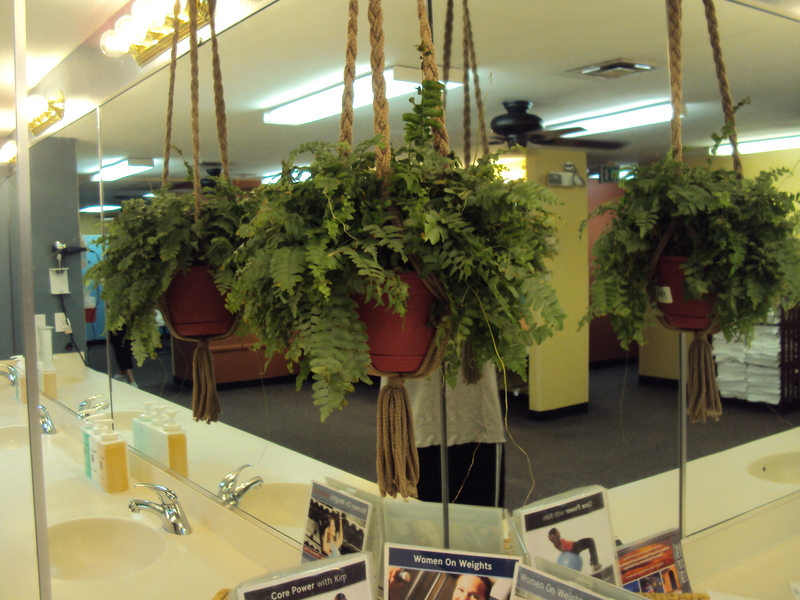 Good to Grow’s 100th Post Thank You Gift Giveaway! Last week, Noelle over at Ramblings from a Desert Garden (she doesn’t ramble, by the way) celebrated her 100th post. She celebrated by giving away some adorable t-shirts made-to-order by her talented sister, Chicken Farmer. Amazing prize! Congratulations Noelle – your photographs are beautiful, and your knowledge of desert gardening inspires me. Thank you! I want to celebrate, too, but do I have anything near that cool to giveaway? Nope, not even close. But still, I began looking around the casa for ideas. 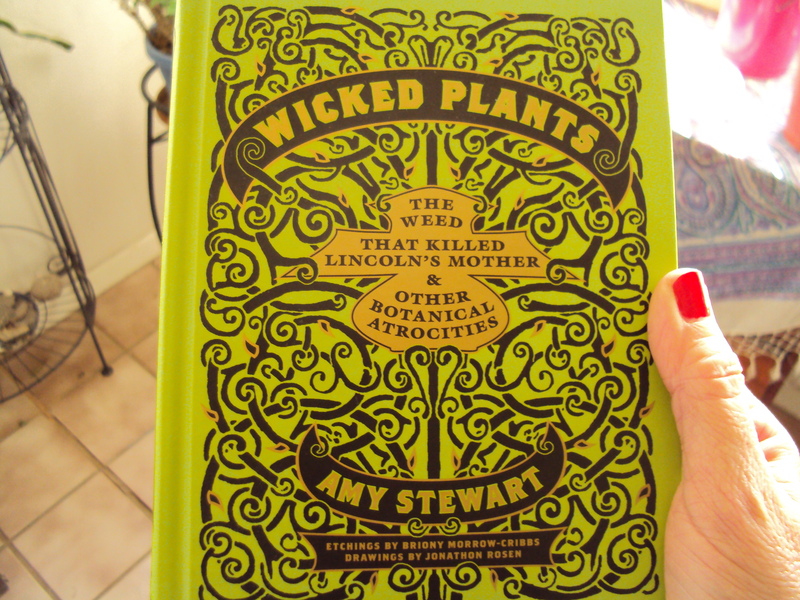 Have you seen this book, Wicked Plants by Amy Stewart? It’s published by Algonquin Books of Chapel Hill, 2009. It’s amazing! She lists all sorts of deadly plants under interesting chapter titles, like “The Devil’s Bartender,” “Botanical Crime Families,” “Dreadful Bouquet,” and “Weeds of Mass Destruction.” It’s filled with history, interesting facts and very, very useful information. Nature is dangerous, folks, not that I need to tell all you gardeners! This would make a great gift for my 100th post giveaway. Sadly for you, I’m not parting with it. It’s too awesome! It’s going in my permanent collection. Sorry – I warned you that I’m not above tricking you all! Heh, heh, heh! Back to the search. I found a few things that might be good gifts – I’ll present them all and let you have your choice. Unless that choice is the book. Then the answer is no, you still can’t have it. It’s mine, all mine! 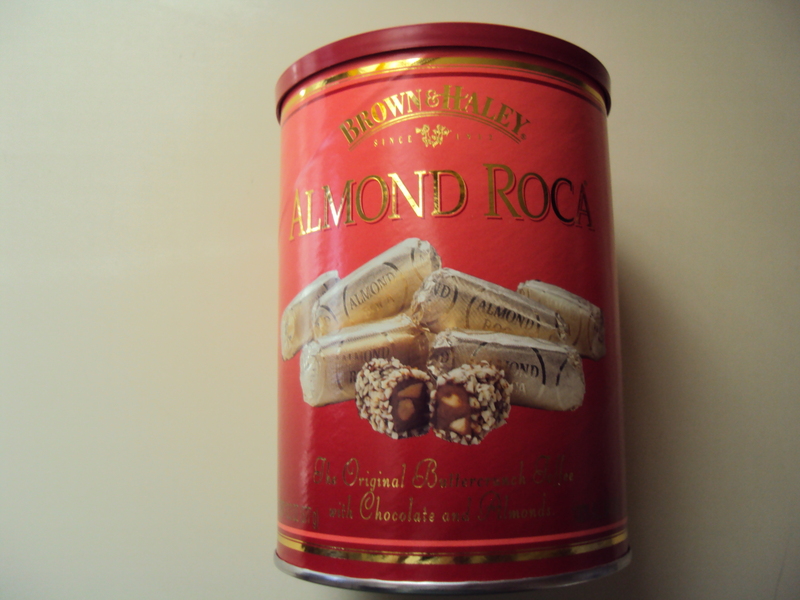 Oooh, I have this yummy Almond Roca buttercrunch candy that I could send you. It’s chocolate almond covered toffee. But, um, I’ve already eaten about half the can. 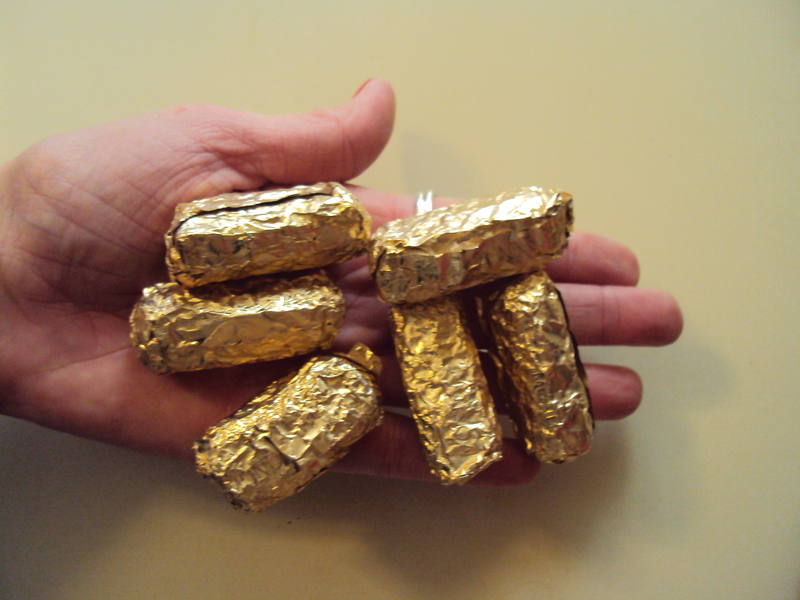 So I could send you a handful. Actually, this is probably best for locals only – I don’t think chocolate would make it to say, Australia. 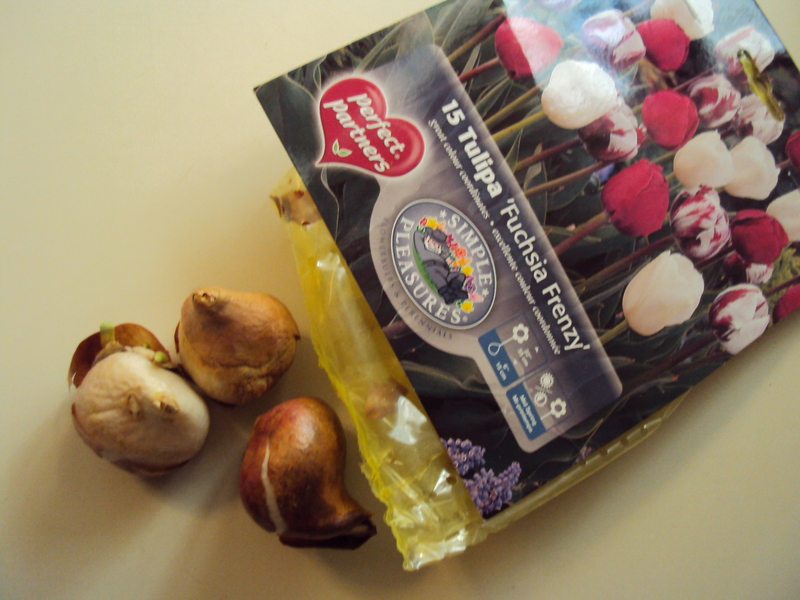 I found three Tulip bulbs that I would be happy to pop in the mail to the lucky winner. 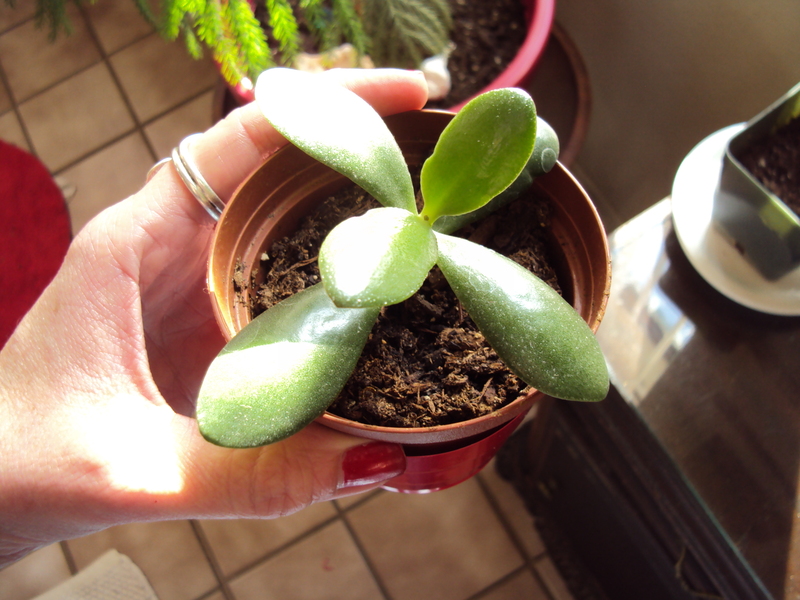 Here’s an adorable little Jade cutting that I would be willing to give away to the winner. Jade plants are considered lucky for financial success, and are sometimes called “Money Tree.” She’s the offspring of Rosa the Jade, so she’s bound to be cheerful and laid back. I’ll package her very carefully for her journey (and send her FedEx). 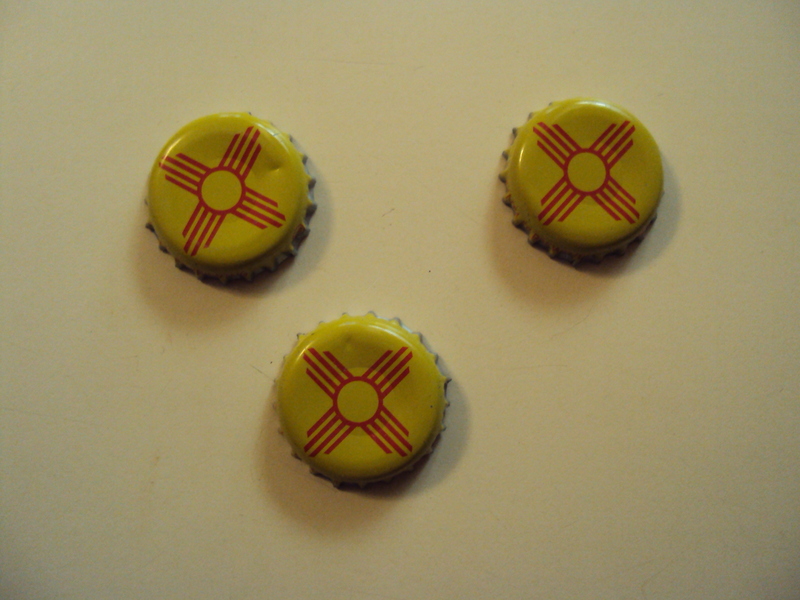 Or, I could make magnets from these Land of Enchantment beer caps. I would send more than three and package them in some cute way (yet to be envisioned). They are caps from the Santa Fe Brewery’s Pale Ale Beer. Let’s review: if you are chosen as the winner of the Good to Grow 100th Post Thank You Gift Giveaway, you have your choice of a handful Almond Roca candy (Albuquerqueans only, please), three Tulip bulbs, a Jade cutting, or a small bag full of New Mexico magnets. It’s an overwhelming choice, I know. Yeah, I can dream about made-to-order t-shirts, but my reality is various things I found around the house. Count yourself lucky that I didn’t start looking through the refrigerator for ideas. Are you feeling lucky? Let me know your gift choice in the comments section, and next week I’ll put everyone’s name in a hat and randomly pick a lucky winner. Semi-lucky. Kinda lucky. Ok, maybe not lucky at all, but you will also win my gratitude for playing. That counts for something, right? Lordy I hope so! Again, thank you all for your warmth and love. I would love to keep this site up forever, and I will so long as I know I can bring a smile to someone’s face, or teach someone something they didn’t know about houseplants or a garden. With your support, I feel confident. Before I go, I would like to say a few specific thanks to some very dear people. Thank you to: My Mom, of course, because I love her so and she’s so good to me. My sister Molly over at Charlotte’s Fancy, has been a continuous source of knowledge, help and love. My other brothers and sisters rock – Christopher, Landy, Gilly – I love you all and feel lucky to be part of such a big immediate family. Thanks for being there for me, and thanks to all the spouses, nieces, nephews and extended families of Foxes and Wheelers out there, too. (How many points does 100 posts get? I’m thinking about 360,482. It’s no baby, but it’s a LOT of work deserving many points!) I’d also like to thank my panel of experts (the blog favorites, as evidenced by the numbers they pull each Friday): Tina Quintana, EZ Ed Johnson, Dottie Correll, and Lewis Casey. You guys amaze and amuse me each week. Also, my good friend Travis over at Guerrilla Graphix is responsible for the graphics of our impossibly silly sunflower heads. Webb Johnson, Tim Thackaberry and Mary Holyoke have been my sounding boards and advice givers. And all my friends have helped me every step of the way! Thanks so much to you all. There are too many wonderful gardeners in the blog world to thank, but my earliest followers deserve a shout out. Mr_Subjunctive at Plants Are the Strangest People has given me so much valuable advice and support, as have James at James and the Giant Corn and Martha at Water Roots. You guys have been there from the beginning – thanks to you all! I’d also like to thank Dad, whose love of plants took awhile to sink in to my consciousness, but it’s firmly there now. If he were still with us, I think he would be really proud. Thanks Dad! And then there’s my dear friend from my hometown, Andy Williams, who prompted me to start this venture. He said, “If you educate, they will come.” Well, not exactly, but that was his gist. And his point was well-taken – I am here to help, to serve humans, and to get kids and adults alike to learn the healing power of nature. There are so many people out there doing the same thing – I hope we all succeed beyond our wildest dreams. Thank you Andy, for your wisdom and enduring friendship.